In the 19th century, the expertise of local industrial workers made Birmingham one of the major pen=making centres in the world. 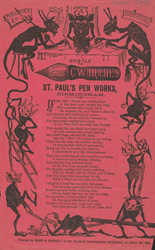 George W Hughes founded his pen-making works in 1860 in St Paul's Square, moving to larger premises in Legge Lane in 1893. A highly skilled technician and businessman, he understood metallurgy and the complex process of heating metals, and thus produced very high quality nibs. Hughes opened offices in London in 1888. Although the firm eventually ceased production in 1960, the factory in Birmingham stands today.